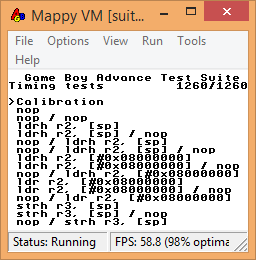 In the interest of furthering the state of Game Boy Advance emulation, I've been writing a test suite that tests various aspects of hardware. At the moment, it only tests timing operations, but way more will be coming in the future. Source code is available on GitHub. Each test contains 44 configurations. The current version contains 1552 tests total. The current version contains 123 tests. The current version contains 1560 tests total. Each test contains 36 configurations. The current version contains 936 tests total. Each test contains 3 configurations. The current version contains 93 tests total. Each test contains 5 cases: the outputs in registers r0 through r3 and the program state flags. Note that for most of these tests, r0 is the only important case, although some games may rely on the other values. The current version contains 625 tests total. These tests only apply to emulators with HLE BIOS. The current version contains 1256 tests total. 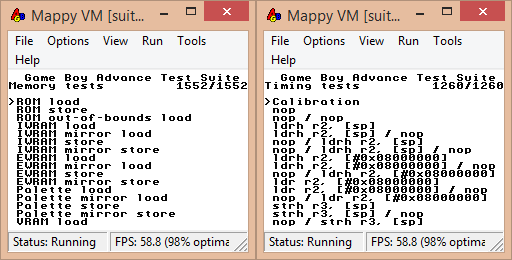 I've been running some Accuracy tests of Android emulators, so far testing GB/GBC, NES, SNES, and GENS/MD over on reddit which has seen quite a bit of enjoyment by the community there. By far the number one requested console I test next has been GBA. As of yet I've only found ARMWrestler and CPU Test by Deadbody as suitable test ROMs. I didn't consider that enough testing to truly make a good test suite out of but your tests here look extremely promising. Basically what I'd like to ask you is would you consider your tests plus the two CPU tests above as sufficient to make a general statement about accuracy? Or should I hold off until there are further tests I find/you expand your test suite? Oh my god no, this test suite is woefully inadequate at the moment. I hope to improve it, but it's nowhere near done yet. Also, it's worth noting that four of the tests in armwrestler (all of the ldm writeback tests) fail on actual hardware, so that test suite isn't that great. 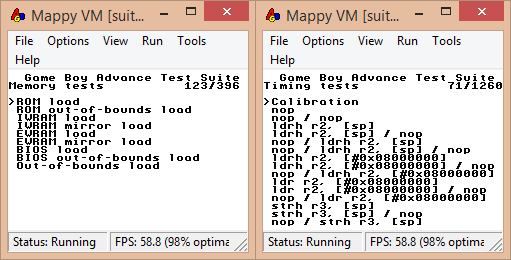 CPU Test by Deadbody is extremely minimal, too. Ah damn, well glad I asked. I'll certainly be keeping an eye on your test suite for whenever you judge it adequete. Thanks for your info on the other tests, I know I'm grasping a bit at straws here but I would love to do some kind of real testing. (07-02-2015, 03:50 AM)endrift Wrote: Oh my god no, this test suite is woefully inadequate at the moment. Mappy VM is a great example of this being the case. byuu Wrote: That's very cute! :D A bug is causing it to show as if it passed 100%. I looked at the source; no prefetch emulation. It's not stupid if it works. New version out with some memory loading tests. mGBA is top again, as one might come to expect by now. Strongest Emulator is gone forever. RIP in peace. There will be a new build coming tonight with a fuckton more tests, and then double that if I end up doing the store tests today too. Edit: Q: Can I use r26 to make a list? Edit: Q: Can I use r29 to make a list? Edit: Q: Can I use r33 to make a list? Edit: Q: Can I use r35 to make a list?